Following the disaster movie formula to pitch perfect precision, San Andreas works thanks to its spectacular visual effects and an agreeable cast led by the huge screen presence of Dwayne Johnson. 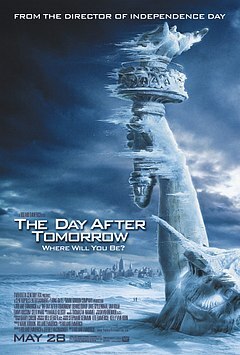 Disaster movies usually base their “plot” around three distinct groups of character: the action hero, the survivor, and the egg-head. Sometimes those groups merge (in Twister the action heroes are also the egg-heads). Sometimes in a rare movie such as The Impossible, they aren’t needed at all. For San Andreas this disaster movie formula is not only adhered to, but cherished. Directed by Brad Peyton (Journey 2: The Mysterious Island) and based on a screenplay by Carlton Cuse (known for his work on TV shows Lost and Bates Motel), this $100 million sure to be blockbuster stars newly crowned action king Dwayne Johnson as helicopter pilot Ray (the action hero), who must rescue his in peril daughter Blake (Alexandra Daddario, playing the survivor role) after a huge –as in freakin’ massive – earthquake rips apart California. Playing the part of the egg-head is Paul Giamatti, who brings the gravitas and provides plenty of exposition as a seismologist who predicted the earthquake to deaf ears. 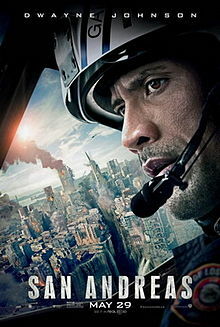 With recently released formula-messing disaster movies such as Into the Storm (found footage theatrics and no star power) and 2012 (overlong running time and ridiculous social commentary) scraping the bottom of the disaster movie barrel (and believe me it’s crowded down there), the decision to keep San Andreas as classic as possible is one that works. This is a film that knows what it is and makes no excuses, happily owning its more cringe worthy moments while standing proud by its action spectacle. While the sight of a metropolis destroyed has become old-hat of late with a glutton of superhero movies laying waste to all matter of city, the scenes of natural fuelled destruction in San Andreas are never the less impressive, as earthquakes and tsunamis are portrayed in gleefully over the top (yet thankfully not Roland Emmerich-esque) style. Adding to the VFX spectacle is a true sense of chemistry between the core trio of Johnson, Daddario and Carla Gugino, who plays Johnson’s estranged wife in what is now her third film alongside the former WWE superstar. While Johnson’s hulking frame and charisma makes him an appealing action hero to root for, even more impressive is Daddario who successfully manages to keep the Johnson-less (pardon the pun) scenes afloat with her own disarming presence. When during an incredibly poorly timed moment in the film a character looks at her and gaspingly states “You are unbelievable!”, one can’t help but nod their head in agreement…after shaking it in disbelief. Such is the experience of watching San Andreas.